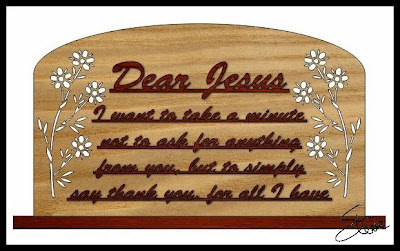 "Dear Jesus I want to take a minute not to ask for anything from you, but to simply say thank you, for all I have.". The base on this mantle prayer is fourteen inches long. The backer board is seven and a half inches tall. The text will be cut from quarter inch thick wood. 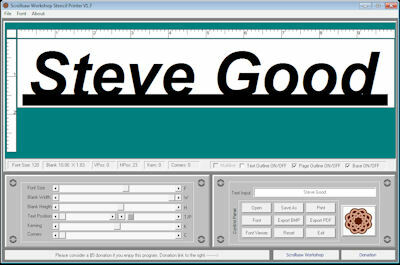 There are several small interior cuts in the text. You will need a #1 or a #2/0 blade for some of these cuts. Micro drill bits will come in handy. 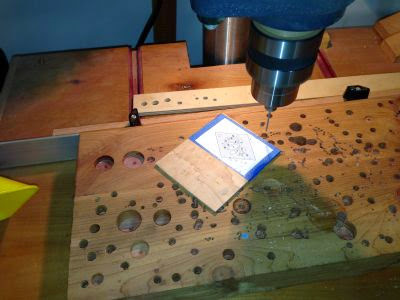 You may get by with a standard 1/16" drill bit if you are very careful with your drilling. If none of these options are available to you then resize the project to a size that is comfortable to you. 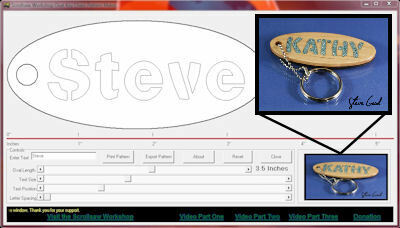 You can use the free RapidResizer tool available on my blog or visit a print shop and ask them for help. 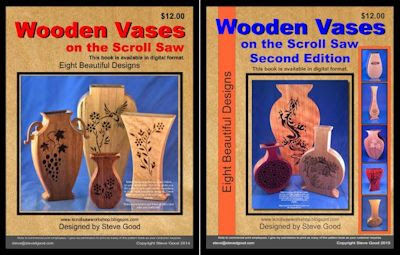 I want to thank everyone who has purchased my new book of Wooden Vase Patterns. The feed back has been very nice. Some people have already made all eight patterns and are asking for more. I am working on volume two but it won't be available for a while. 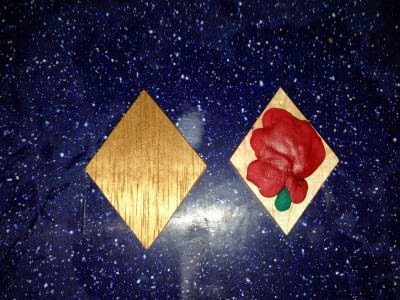 Here is a look at one of the vases in volume two with a color inlay using the FIMO clay technique I have show here before. I have other ideas for the next book that I think you will love. 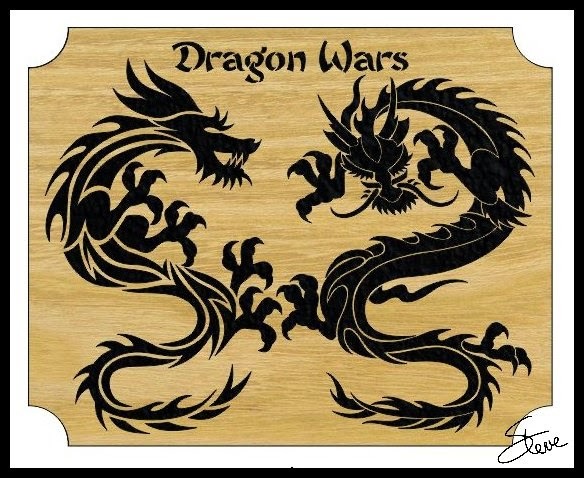 Dragon Wars Scroll Saw Pattern. 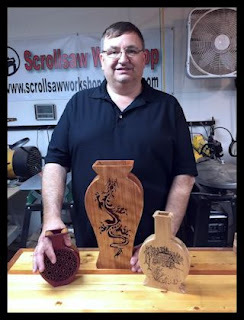 Walnut is a wonderful wood to use on the scroll saw. It's one of my favorites. 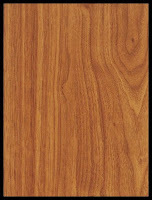 It is a deep rich brown color and the grain patterns can be quite beautiful. Different species of walnut grow throughout the world. Here in the US the most common species is Black Walnut. I use a lot of walnut with maple because the contrast between the two woods is so great. The light maple and deep brown walnut can make a project pop. 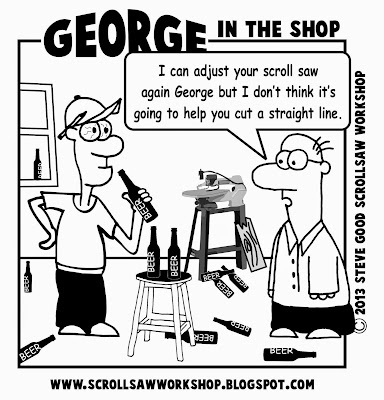 In many cases we scrollers are more concerned with the color of the wood we use instead of the grain pattern. Furniture makers seem to always be hunting that beautiful grain. Scroll saw projects are often small and the grain is just not that apparent. The sap wood can be very pale. I like to keep projects natural so including a little bit of sap woods looks good to me. Too much walnut sap wood can be overwhelming though so you often have to cut it away. For a while all my local suppliers could only get walnut with lots of sap. Lately it's been better. Walnut has gotten pretty expensive lately. It's runs around $8 board foot and it's getting tougher to find wide boards. When I'm buying lumber I try to stay with at least eight inch wide boards to keep my options open for the most different projects. Walnut is not an exceptionally hard wood and it cuts beautifully on the scroll saw. It is dense enough to hold up to minor abuse. It sand well and take glue nicely. 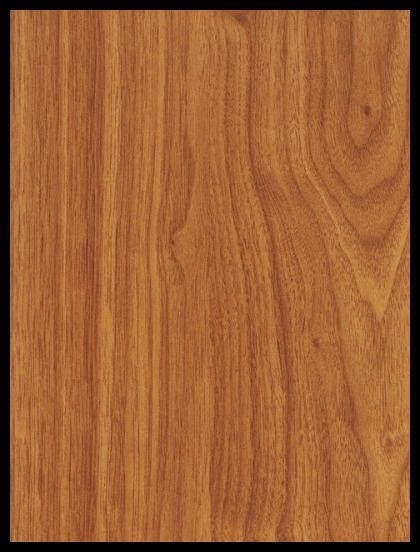 If I had to choose one wood to make my projects from it would be Black Walnut. Cowboy Welcome Sign Scroll Saw Pattern. 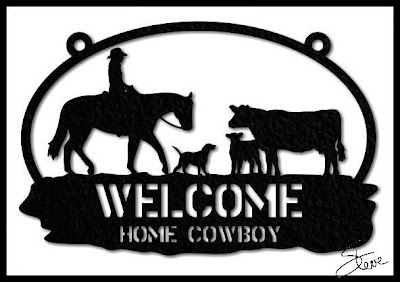 Cowboy welcome home sign cut from 1/2" wood and painted black. I get emails all the time asking what blades I use. I answer Flying Dutchman brand from Mike over at www.mikesworkshop.com. 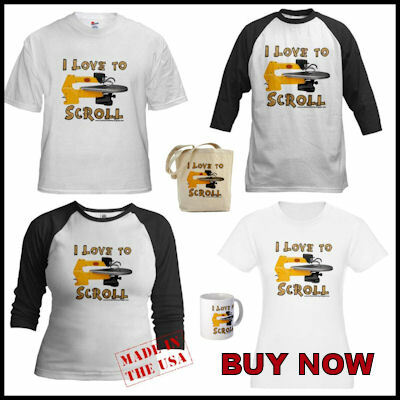 Most long time scrollers will have their favorite blades. Some will have multiple brands with certain blades from each brand and others are brand loyal. I am the brand loyal guy. I have used just about every blade out there but I always end up back to my Flying Dutchman blades. It's just a preference. I won't get into debates over which blades are best. My opinion is obvious but use what works for you. If you do try the Flying Dutchman blades I have a recommendation. I have always been a fan of the Scroll Reverse model for the splinter free finish on the backside of the cut. A while back when I was talking with Mike he suggested the newer Ultra Reverse blades. Mike never steers me wrong so I bought a bunch of different sizes. 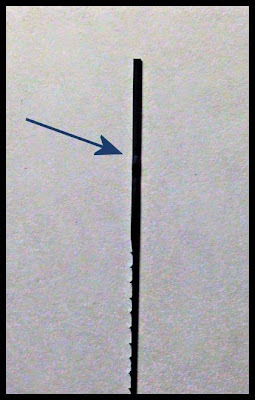 The big feature of the blade besides the reverse tooth pattern and the hardened steel was the dimple. The dimple serves a very simple purpose. It lets you instantly know which end of the blade goes up. At first I thought it was more of a gimmick than a true feature. Boy was I wrong. That dimple comes in super handy especially on the smaller blades. Even after 30 plus years of scrolling I would still occasionally install a blade upside down. My fingers are callused and feeling the small tooth pattern was not that easy. Now I never even have to think about it. Grab the blade by the dimple and install it. As I get older the simple things seem to make more of a difference to me. I love that dimple. Flying Dutchman Brand Ultra Reverse Blade with Dimple. 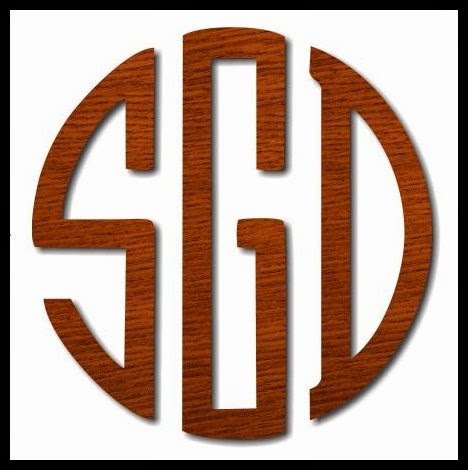 Monogram Maker for your scroll saw projects. 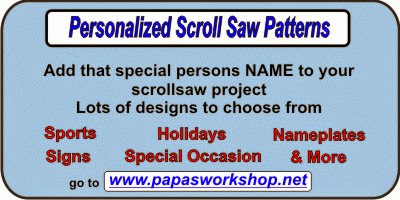 Here is a link to a website that has a monogram maker that I think you might find useful for your scroll saw projects. These can be saved to your computer and printed as a pattern. The image above is an example of the one I think is useful. Watch the video and see if this is something you could use in your projects. This website is a commercial site that sells merchandise with your monogram. They will ask for your email address. The video shows a solution if you don't wish to enter your email address. 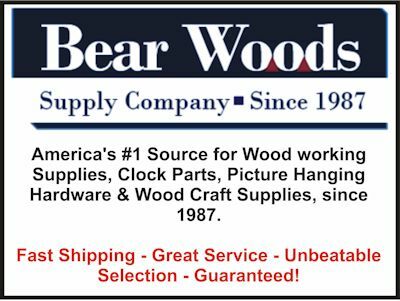 I have no first hand knowledge of the site so I am not in any way recommending their products. It does look like a nice site with interesting products. 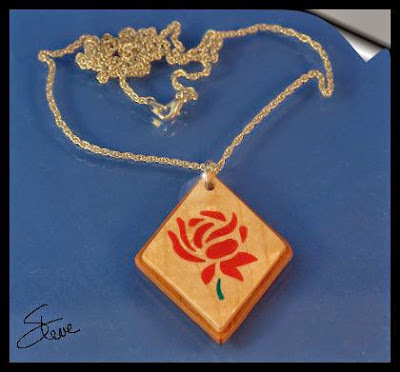 Wooden Rose Pendant with Polymer Clay Inlay. Experimenting with the Microwave. 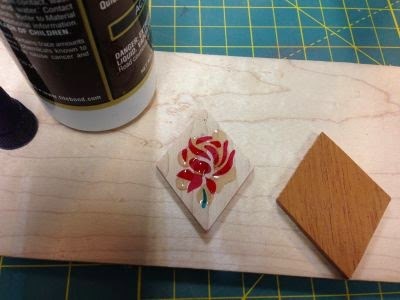 This is a pattern of a pendant with a polymer clay inlay. 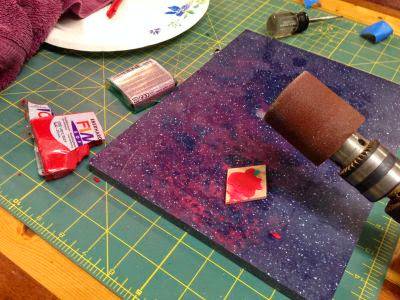 Normally polymer clay is baked in the oven. I wanted to experiment with the microwave. This is not a recommended technique so if you feel more comfortable use the oven. The oven works fine but I just wanted to try something different. They use to say not to let the clay burn or touch utensils that you will use for food because the clay contained some toxic materials. 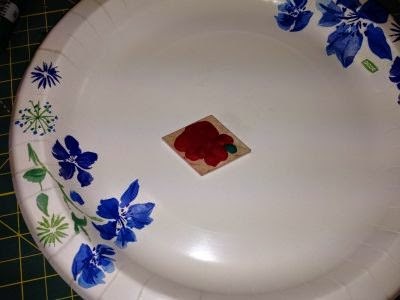 I have been informed that modern polymer clay no longer has this issue but I think I would still stick to paper plates for the microwave. 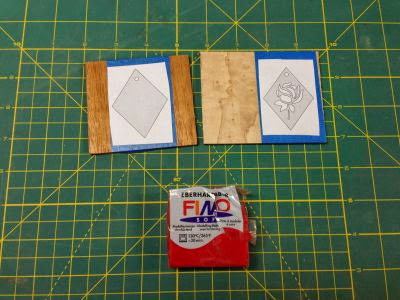 I prepared the pattern and wood blanks. Use 1/8" thick contrasting woods for best effect. 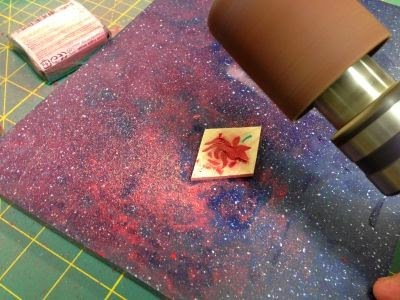 I will use red and green for the inlay. Cut the pieces at the scroll saw and sand the fuzzues off. 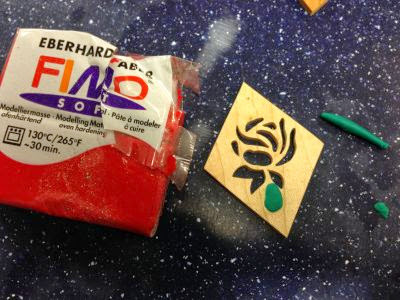 Knead your green clay and insert it into the stem cutout. Remember to overfill the cutout. 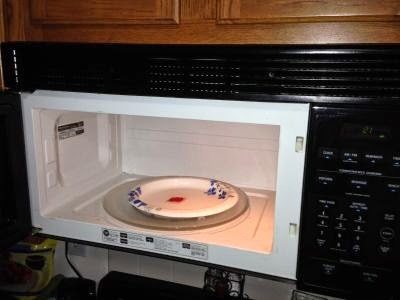 Here I'm experimenting with the microwave. I zapped it for 15 seconds at a time. I ended up with a total of 45 seconds but it was just starting to smoke so I think I could have stopped a few seconds earlier. Microwaves vary so experiment on test clay before you zap you project. The clay will continue to harden as it cools. I'm ready to start sanding. 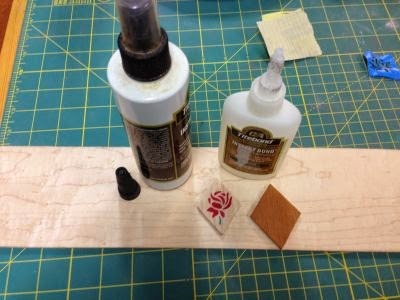 Use whatever sanding tools you have available. I'm using an air filled drum sander because it's pretty gentle. Don't get aggressive but sand it nice and flush front and back. 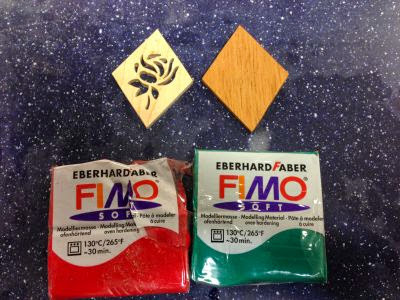 Take you time and switch to hand sanding towards the end if you feel it will work better. If a pieces does come loose don't panic. I have only had that happen once and it was easy to super glue back in place. When you are finished sanding it should look like this. I'm using a two part super glue because it's fast. I apply the super glue to the back of the inlay. This will secure the pieces in place. Actually they are generally pretty secure on their own but the super glue is a good idea anyway. 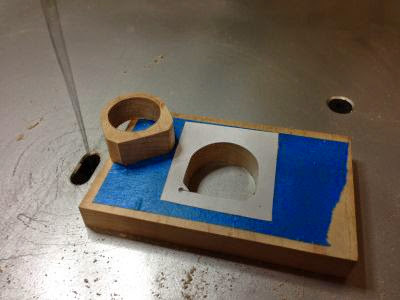 After the pieces are glued together you can drill the 1/8" hole for the ring. Apply the finish of your choice. I used spray acrylic. Insert the metal ring in the hole and attache the chain. 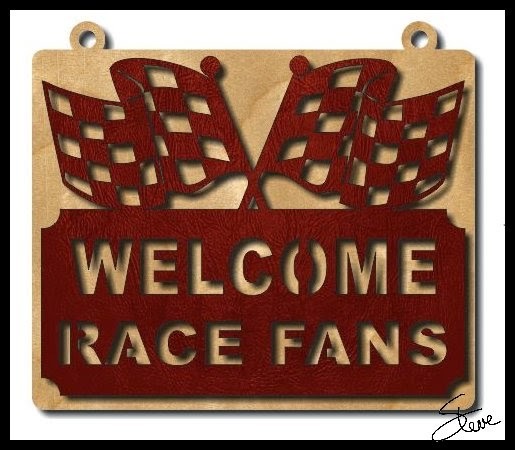 Welcome Race Fans Scroll Saw Pattern. A sign pattern for those of you who enjoy the sport of auto racing. State Trees of the United States. 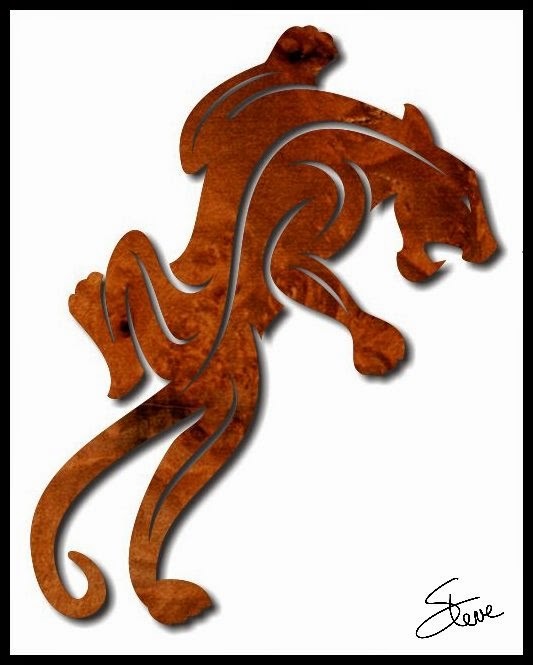 This jaguar pattern is over 14 inches tall. I simulated it here with a wood texture but this might be a good time for paint. I can't believe I'm recommending paint but this just calls out to be solid black. I have this problem covering wood with paint but when it works it's okay I guess. The graphic is from vectorportal.com. It is available for personal and commercial use. I only slightly modified it to make it ready to cut. I just answered an email from a guy who is just getting started in the hobby. He wanted to know what tools he needed to get up and making projects on his scroll saw. I know what all you tool fanatics are thinking, "That's like asking a child what he wants for Christmas.". That's exactly the way I feel. I love tools and enjoy having a complete shop. 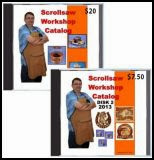 It has taken me 30 years to stock my shop and that's how most woodworkers go about it. We start out small and over time build it out. 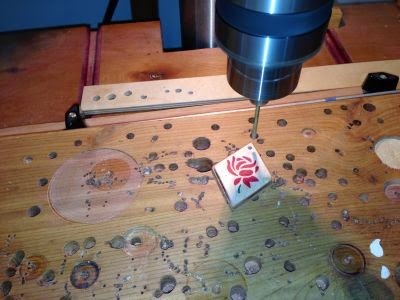 The good news is that after the scroll saw and a drill to cut the entries holes, all the other tools fall somewhere between necessity and luxury. Tolls like the table saw, drill press, planner and band saw all mostly fall in the wood preparation category. If you are buying ready to scroll boards then these tolls become a bit less necessary. If I were looking at building out my shop from scratch I would buy them in this order. Table saw, drill press, planner then the band saw. I could spend hours explaining my choice here but mostly that's just the frequency I use those tools. The next set of tools would be what I will call finishing tools. 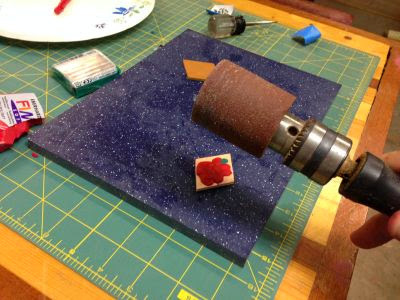 The disk sander, belt sander, spindle sander are all tools I use to sand and shape projects. You could also throw in rotary type tools in this group also. This would be a tough call between the disk sander and the belt sander for which I use most. Many belt sanders also have a disk sander so that's going to kill two birds with one stone there. The spindle sander is awesome when you have curves that need to be sanded but I could get by without one if I had to. 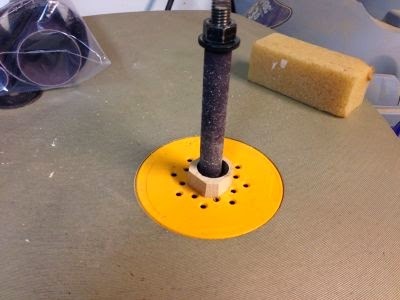 You can also install a drum sander in a drill press and get the same results.You could substitute a rotary tool for many of the spindle sander jobs. They are not too expensive so you could save some money there. I'm sure I'm forgetting someones favorite tool but these are just what came to mind while I was answering the email. 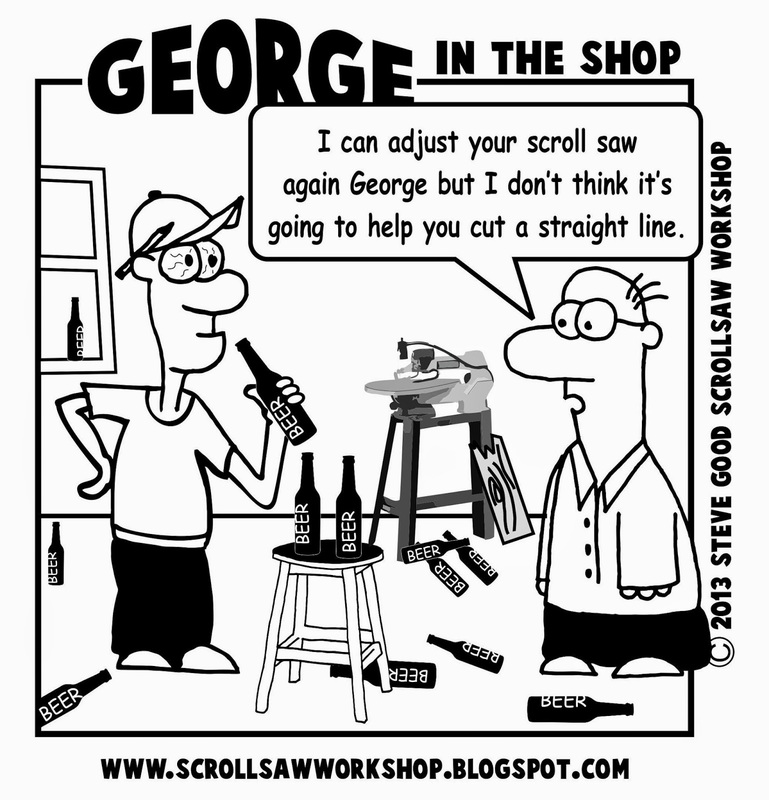 If you are just getting started don't worry if your workshop is not loaded with tools. I have seen incredibly impressive projects come out of shops with a bare bones setup. Learn to use what you have. If you enjoy having tools then slowly build out your shop. Try to steer clear of the ultra cheap tools. I know they are tempting but the investment rarely works out. If your budget is really tight go for second hand mid range tools instead of the cheap stuff. Flea markets, auctions, yard sales, Craigs list, and ebay are all places to find tools. Just do your homework before you buy. One more note about tools. If you are trying to sell your projects then many of the tools I listed become a necessity. They say "Time is money" and no where is that more true than in selling crafts. 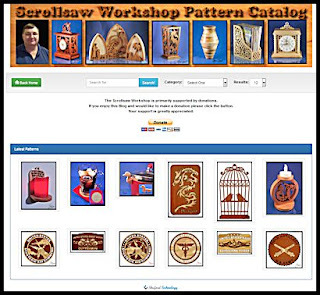 You absolutely have to move at a quicker pace when you are trying to maximize your profit with craft sales. 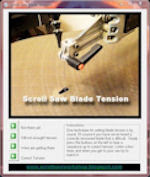 A tool that may be a luxury for a hobbyist becomes a money maker for a professional. 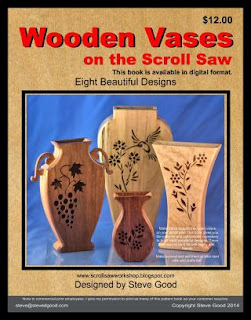 A good example are the vases I have been making. Without good power sanding tools I could make the vase but it would easily double the time. It would only take a few sales to make the purchase of a power sander pay for it's self. 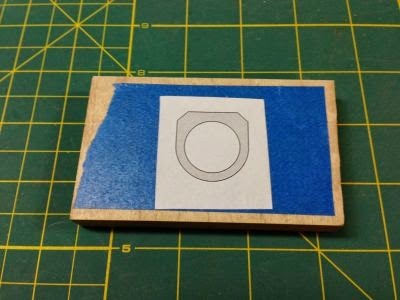 Man's Scroll Saw Initial Ring. This pattern has a man's initial ring in sizes from 5 to 13. If you tapered the back of the ring to less than 1/4" it might pass for a woman's ring. I think it's a bit big for a woman but tastes vary. 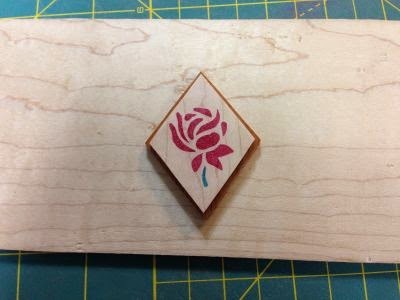 Apply the pattern to the 1/2" thick wood blank. 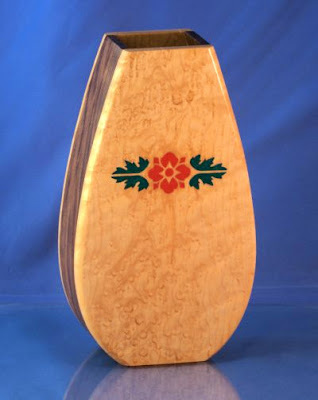 I used maple because it is so durable. Any wood will work fine. Cut the ring free being careful to cut the interior on the line. You don't want to change the size too much. 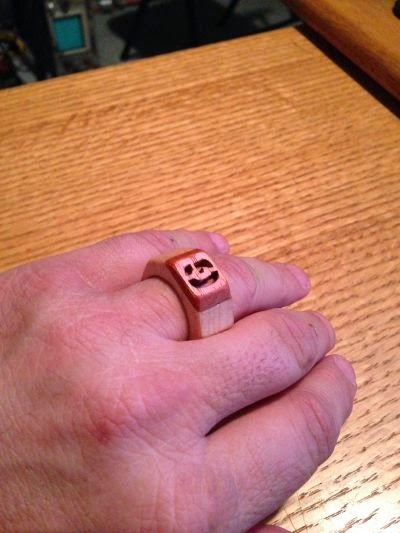 Start sanding the ring. Get in interior round and smooth. Contour the band of the ring with a gentle round-over. Take your time. The sanding is very important in this project. 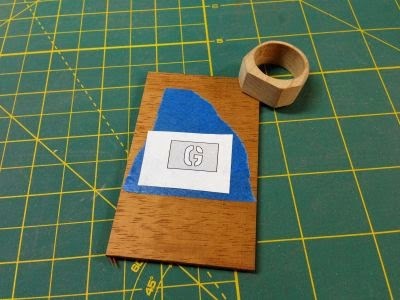 Cut the initial from 1/8" Thick contrasting wood. The letters are small so take your time. You can use the edge of the blade to nibble away the hard to reach corners. Glue the initial to the face of the ring. I used super glue just because it dries fast and I didn't want the initial to move around. It would be difficult to clamp. Notice how the initial plate overlaps the edge of the ring. We will sand the angle flush. 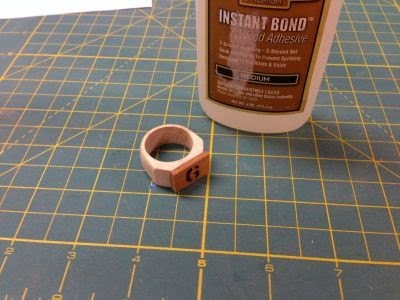 In this last picture you can see how the initial plate was sanded to match the angle of the ring. I want to emphasize again that the sanding makes this project. I applied a spray acrylic but you can use your favorite finish to make it shine.